So you’ve met with a potential client, you’ve put together a proposal in Practice Ignition and you’ve sent it to the client. That’s fantastic! But wait - it’s been a week and the client hasn’t yet accepted your proposal! How should you approach the client to urge them to sign? Whether you want to follow up automatically, or follow up with a more personal touch, let’s look at the ways Practice Ignition helps you with following up sent proposals to seal those deals. Practice Ignition gives you visibility to the status of each proposal, so you always know exactly which ones you need to act on. Click here for more information on proposal reminders. For a more personal touch, we recommend using the Conversation option. 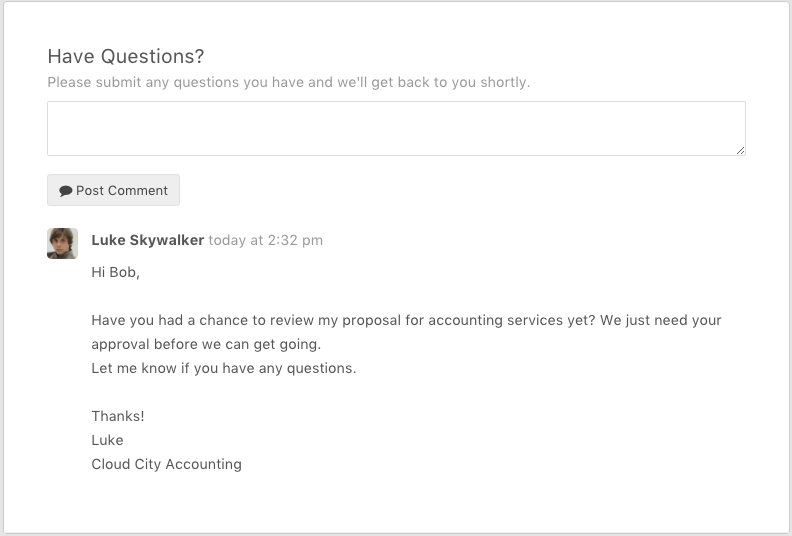 This is an effective way of following up as your client will be able to view and accept your proposal just above your message, and are encouraged to submit any questions via the acceptance page. You can very quickly select all proposals awaiting acceptance and re-send them. Use the select all tick box, or select individual proposals by ticking the box next to them. A Bulk Actions drop down will appear at the top of the screen. Choosing Re-send Selected will simply re-send the selected proposals, and your clients will receive them in their inbox.